This popular, fast and reliable sports car, with sensible performance modifications, creates a superb platform for competitive racing that is suitable for both experienced and novice drivers These Mazda MX-5 Mk3 cars, although modern, are not complicated and can be run from home (as many of our drivers do), or there are several specialist race preparers who offer race support as well as ‘arrive and drive’ packages. In the inaugural season, the Super Series will offer competitive racing in a relaxed environment. Each meeting will consist of three races which will form a separate, standalone contest, at 8 different meetings at the UK’s top circuits, including world famous venues such as Silverstone, Brands Hatch and Donington. Race weekends are all triple header meetings, with a 20 minute qualifying session and three 20 minute races at all events, giving drivers plenty of competitive track time. 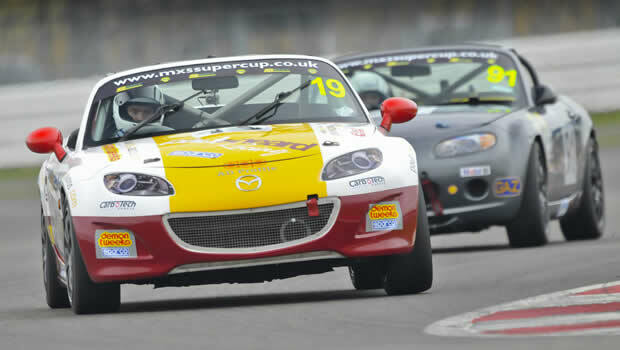 The BRSCC Mazda MX-5 Super Series will also feature a dedicated Race Centre at all rounds. This will be the focal point for the Series and will enable all competitors and team owners a meeting point to socialise. An excellent resource for race information and hot drinks (very welcome by drivers and relatives at cold race circuits). Cost: To give newcomers and idea of the budget required in the first year, we have listed below the approximate costs which are based on the experiences of the drivers already competing in Super Series. This will give you a fair indication as to the minimum cost which is needed to get started if you are buying your own car. However, in year two the cost will be substantially less, as you will not need to build or buy a car. Safety clothing/helmet/Frontal head restraint £2,000 approx.